This picture must have been taken shortly after the JAMES LEE (first) was launched at Pittsburg Boat Yard 1879. She was contracted for by Capt. John Adams who refused delivery when she twisted on her launch rails as she was being launched. Capt. James Lee Jr bought her where she ran out of Memphis. Her engines came from the PHIL ALLAN. She was 241 ft long x 34 ft wide x 7.5 draft. She was powered by 4 boilers each 44″ diameter by 28 ft long. Capt. Adams bought a duplicate hull from the same yard and named her the KATE ADAMS. In 1882 Ways Packet Directory reported Stacker Lee as her captain. Her upper works were badly burned by fire October 3, 1883 and was rebuilt. She was retired in 1894. The metal from her engines was broken up and recast into cylinders for the steamer JOSEPH HENRY. 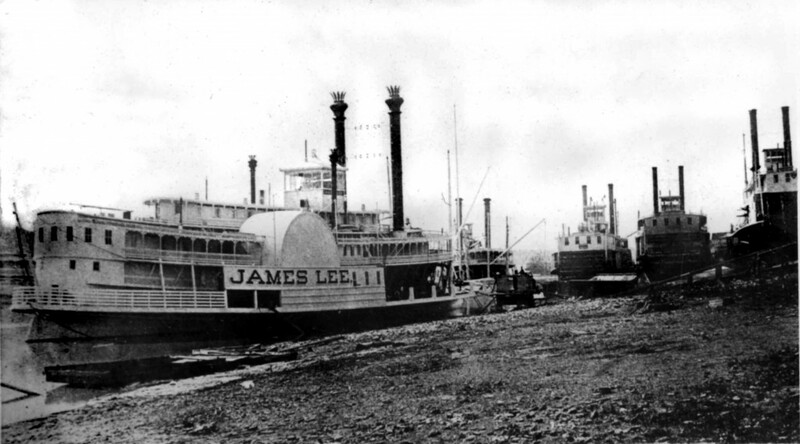 The second JAMES LEE was built at Howard Shipyard Jeffersonville Ind. 1898.